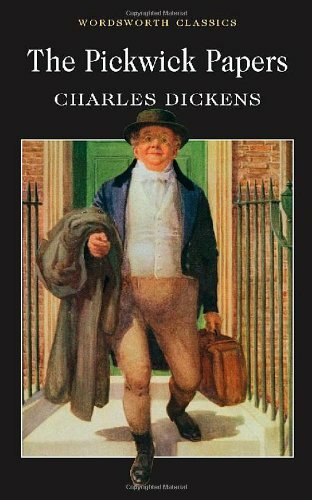 If you read a lot and have any interest whatsoever in the classics, then it's kind of expected that you will read Dickens at some point. I had been a little bit reticent to read him after a few attempts at his work had been stymied essentially because I was too young to appreciate the language and tone. Up until now, the only work of Dickens that I had finished was A Christmas Carol, and that had been quite a few years before, perhaps even a decade. As such, I thought that of all his books to try, The Pickwick Papers might be a good one to start with, since it's supposed to be a comedy and therefore unlikely to bog me down in misery. Admittedly, part of me wondered why I hadn't really heard much about Charles Dickens and his comic efforts, but I put it down simply to a change in interest as he developed as a writer. The Pickwick Papers is essentially the misadventures of the eponymous Mr Pickwick and a selection of his close friends as they bimble around the English countryside, peppered with a few short stories that they hear told on their way. These misadventures usually end in some kind of misunderstanding or slapstick, though the tone does gradually shift more towards a matrimonial and domestic feel towards the end. In terms of structure, it actually reminded me a fair bit of Don Quixote. So, I'll start with the good points. Firstly, the writing itself is of fairly good quality and not terribly difficult to pick up for people who are less familiar with the classics. There's even a glossary for some of the more obscure Victorian terms, which was appreciated considering that there were only a couple that I either knew previously or could glean from the sentence's context. Secondly, while I compared it to Don Quixote, I found that the humour in The Pickwick Papers had aged quite a bit better over the years and wasn't anywhere near as cruel in its slapstick. Thirdly, the short stories that are recounted throughout the narrative are generally quite interesting and entertaining, with the story of the man who was kidnapped by goblins being a particular favourite of mine. It makes me want to read any short stories that Dickens might have written, as he seems to have been pretty good at them. Fourthly, there was some reference to a town fairly local to me through most of my life, which was amusing in and of itself due to the obvious low opinion that the writer must have had of the place. That just tickled me. Now for the bad points. Jesus Christ on a bike, this bored the living daylights out of me. I think the only reasons that I finished reading it was: a) I didn't want to write a DNF review for the blog, and b) there might have been some gift-related obligation guilting me into continuing. While I praised the book for having better humour than Don Quixote, I personally found that it went a bit too far and becomes kind of neutered as a result. There's not really much bite to the humour, largely I think because the majority of the book is so episodic and the characters really two-dimensional. The only character that really stood out for me was Pickwick's servant, Samuel Weller, if only because he seems to have at least a little bit of an inkling about how absurd everyone else around him is. Additionally, I found it really irritating whenever Dickens started writing in dialect, because it just slows every bit of dialogue to a crawl as you turn on your interpreter head. It also seems a bit like Dickens is using the whole dialect thing specifically to differentiate poor people from the rest of the cast, because with the rest of the characters (mainly middle to upper class) he seems perfectly happy to write their dialogue with correct spelling and generally accent-free despite the wide variety of locales that they hail from. So yeah, irritating and awkward, just my luck.